Foundation repair is a vital part of ensuring that your home is safe and healthy. It is one thing that should not be neglected or ignored. It can however, be quite an expense for many homeowners. Most people tend to put off foundation repair because they are worried about the cost. The problem with this is that the foundation failure often becomes worse the longer you wait to fix it. This leads to an even bigger expense later on. For this reason, it is best to have your foundation repaired as soon as you notice an issue. This will save you money in the long run. Because we have your best interests in mind, Atlas Piers offers quality foundation repair services for reasonable prices. 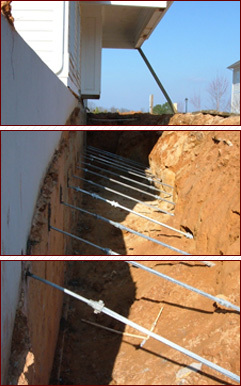 Come to Atlas Piers for the best foundation repair costs Atlanta has to offer. Foundation failure can cause problems like a settling or sinking foundation, cracks in the foundation or walls, bowing or leaning walls, sloped or uneven floors, and windows or doors that stick. Any of these are annoying problems that require professional repair services from an expert foundation repair contractor immediately. Here at Atlas Piers, we provide top quality services and products for all of our foundation repair jobs. Because of this, our prices may seem higher than some of our competitors. The cost is definitely worth it, though, as your home is sure to be safer and more structurally sound than it was before. We also provide various financing options to find the best solution for you. Atlas Piers is always ready to help you out in any way we can. There is no set price for foundation repair; every situation is different. If you want to find out how much the repairs on your home will cost, call your contractor to come and inspect your issue and give you a detailed report of what is going wrong. Then, you can begin to determine how much the repairs are going to cost. Any given foundation repair situation can cost from around $5,000 to $12,000 dollars. The price will most likely be higher if you live in an older home, as it may require additional work. Older homes often have added pressure on parts of the home, meaning that the foundation repair experts you hire will have a tougher job. Living in a new home does not necessarily mean that your problems will be lesser. The best way to be sure that your foundation repair costs Atlanta are not higher than necessary is to fix the problem as soon as possible so that it does not become worse. Regardless of what you do, foundation repair costs Atlanta will probably not be cheap. Foundation repair is, however, important for the safety of you and your family. If you are in need of foundation repair, don’t wait! Contact the experts at Atlas Piers for professional services at reasonable prices.